Provide comfort for the family of Patricia Koehler with a meaningful gesture of sympathy. 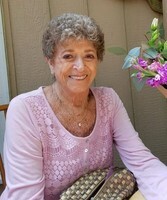 Patricia “Pat” Koehler passed away peacefully March 20th, 2019. To send flowers in memory of Patricia Koehler, please visit our Heartfelt Sympathies Store. Provide comfort for the family of Patricia Koehler by sending flowers. So sorry, Uncle Bob! She was a wonderful lady. Thinking of you!